What to write about Guy Mariano? A skateboarder with his experience and skills knows what’s essential when it comes to the product he skates in. Teaming up with Lakai’s design team including Scott Johnston and Jeff Mikut, there can only be good results. Enjoy the review of Guy’s new Pro Model the Lakai Guymar. The Lakai Guymar fits true to size. 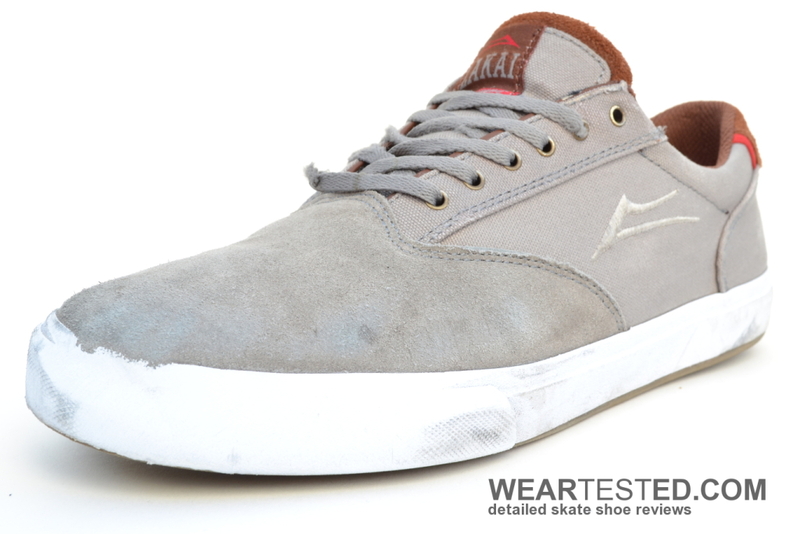 The Lakai Guymar has a clean toecap design. When skating, a one-piece suede toecap typically offers good durability and also provides a nice edge for flick trips. This stands true to the Guymar, which after skating, did not show any noticeable signs of wear. The lateral part of the shoe is canvas, which often reduces the durability of the shoe. However, the designers at Lakai took care of this problem by shifting the one-piece toecap’s seams as far back on the shoe so that the griptape has almost no possibility to get in contact with the canvas. As a result, the stitched Lakai flare and other design elements have also been shifted back, thus further improving durability, especially in combination with the canvas material. A notoriously vulnerable spot along the upper eyelets of the shoe have also proven to be very durable. The only parts of the shoe that showed signs of wear was the rubber in the toe area, especially in the kickflip zone, as well as the sole, which lost a bit of its profile. To sum up, the durability of the Guymar was evaluated as very good. Lakai modernized their vulcanized sole, branded it as VLX, and introduced it with the Guymar. Though the crafted midsole construction has the goal of adding cushioning, the feeling of the sole construction is a bit too direct to the feet, offering only average cushioning. The sole can absorb regular impacts, but nothing more and nothing less. It is a vulcanized sole with typical vulcanized cushioning but has the advantages of a cupsole with regards to the support of the foot. The insole is way thicker in the heel area compared to the toe area, and has the aim of offering a softer feeling of cushioning for the heel. The Guymar has a great shape and features a slim silhouette. This leads to a shoe that is cut very close to the foot in all areas. The model offers a good feeling in the toe-area, the midfoot section, as well as the heel area, which improves board contact without compromising stability. Lakai’s VLK sole construction can be described as a modern vulcanization combining the advantages of both cupsole and vulcanized soles. Traditionally, the edge of a cupsole is characterized by a rounded out edge along the sole whereas a vulcanized sole has sharper edge. Lakai developed a vulcanized sole with a round edge that imitates the feeling of a cupsole. In addition, the height of the sole decreased from heel to toe, offering a very direct and good boardfeel. The sole needs some hours to develop its complete flexibility to result in a good grip. When it comes down to comfort, the slim silhouette of the shoe provides an outstanding foothold. When worn and skated, the foot feels quite secure and is hugged tightly by the shoe. The inner part of the model is almost seamless and helps reduce the possibility of pressure spots. A minor weakness regarding the comfort of the model is Lakai’s choice of hard materials. Unfortunately, even with two ventilation holes on the inner medial side, the breathability is not that stellar. 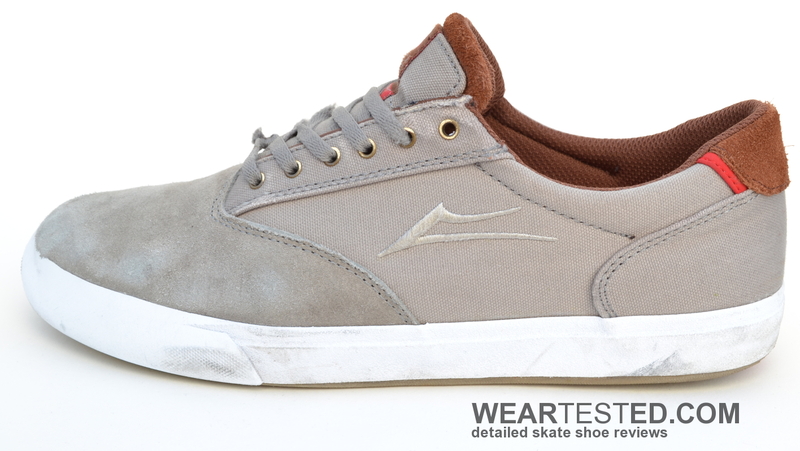 With that said, the Guymar keeps its form extremely well, which upholds the great workmanship put into this Lakai model. Even though cushioning wasn’t fully focused on, the VLX vulcanized construction still offered the stability of a cupsole model. The Lakai Guymar excels with its durability, stability and also boardfeel, defining itself as one of the best skate shoes in 2015 for now. It’s only minor flaws are its average cushioning and breathability.